This post is part II of II, to view the first post click HERE. 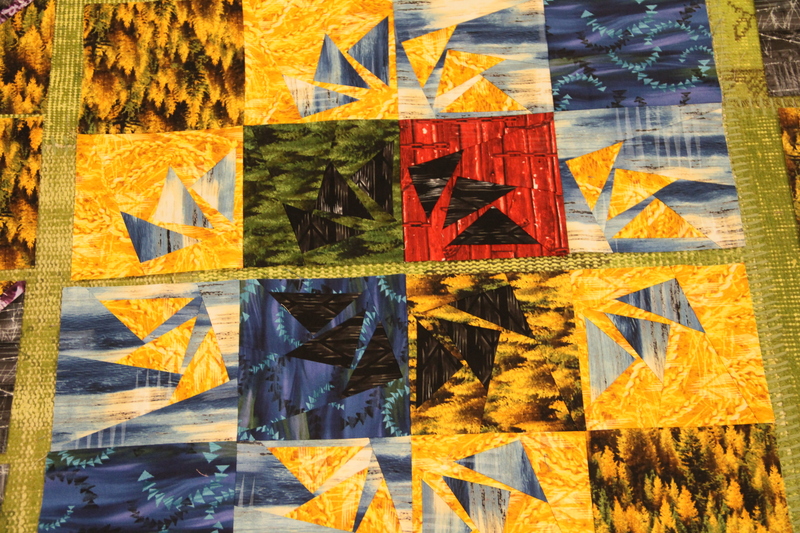 Today we are piecing our “paddlewheel” blocks, adding our accent border and assembling our quilt top. The complete written instructions were included in 2 fabulous magazine articles for spring 2015. 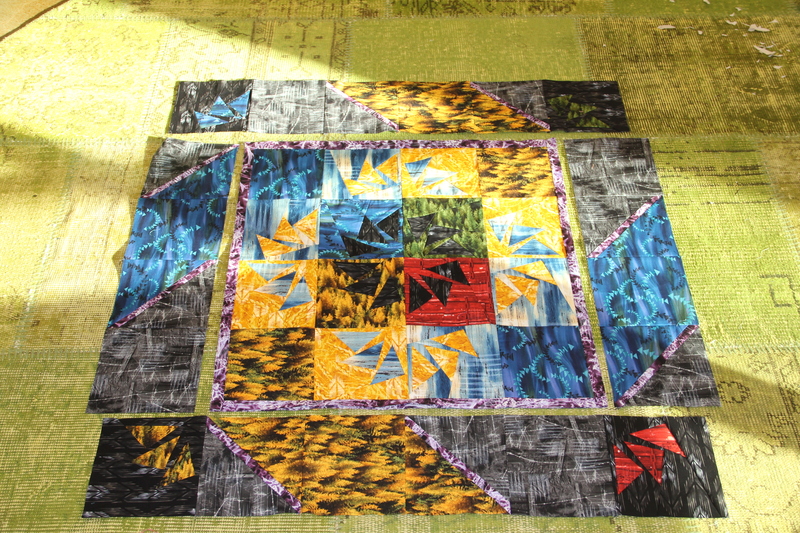 The articles introduce you to Quiltworx.com and the Niemeyer family. 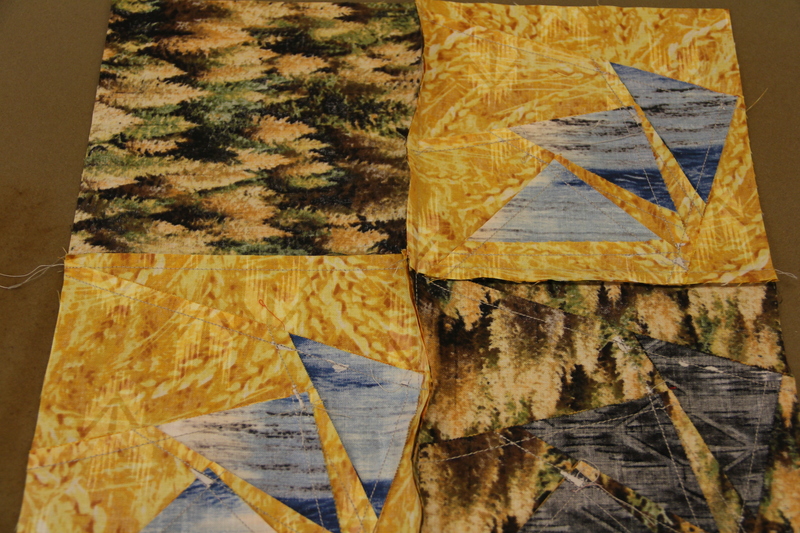 All fabrics for my quilt top were donated by Timeless Treasures and part of the “Reclaimed West” collection designed by Judy and Judel Niemeyer. 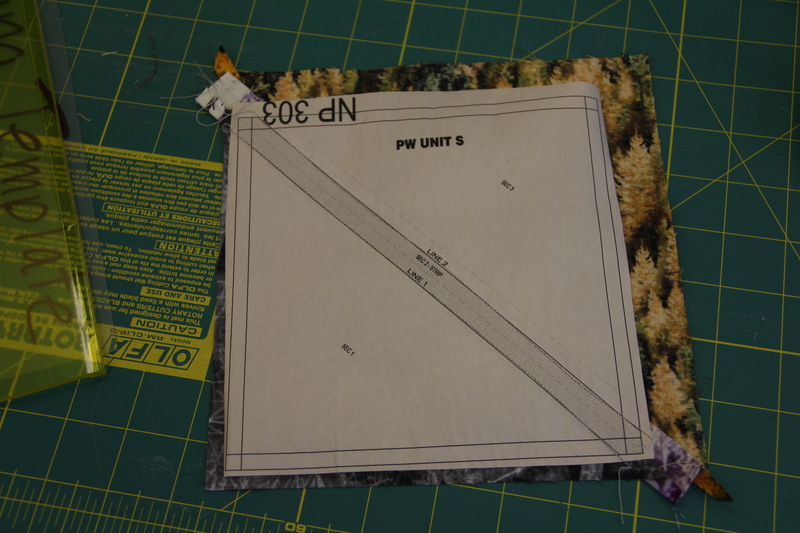 You need (12) 6 1/2″ squares in varying colors per your color layout. 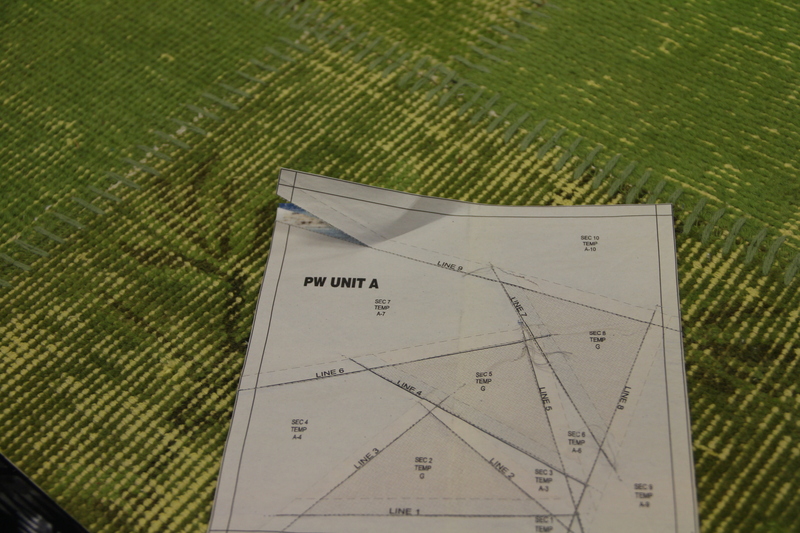 These MUST be cut accurately, they are not for paper-piecing. 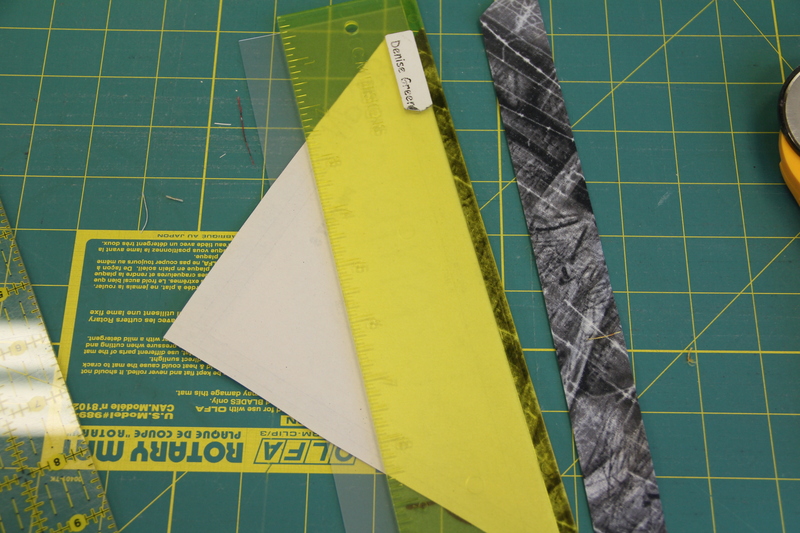 You need (8) 1 1/2″ x 10″ strips – these are the accent pieces for the paddle’s. 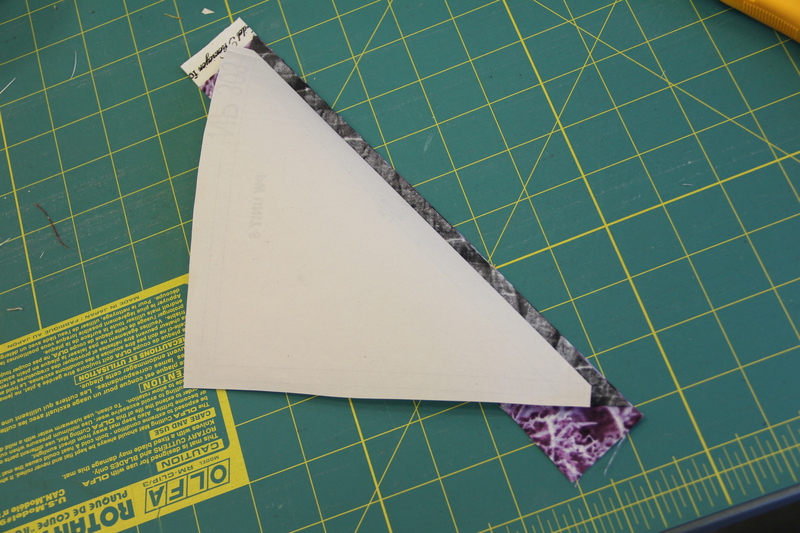 Take one of your triangles from your 8 1/2″ squares and lightly glue the WRONG side of the fabric to the WRONG side of the paper. 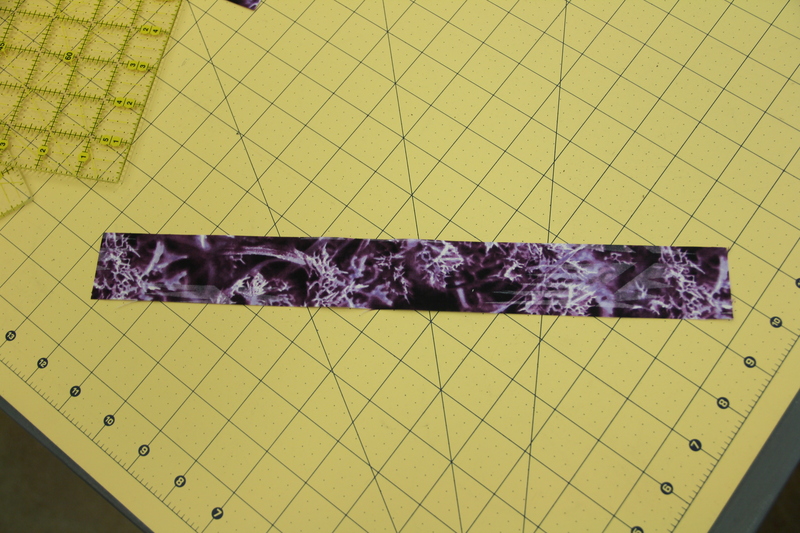 Using your folding template, fold on SOLID line 1, then use your add-a-quarter ruler to trim away the excess fabric and create your 1/4″ seam allowance. 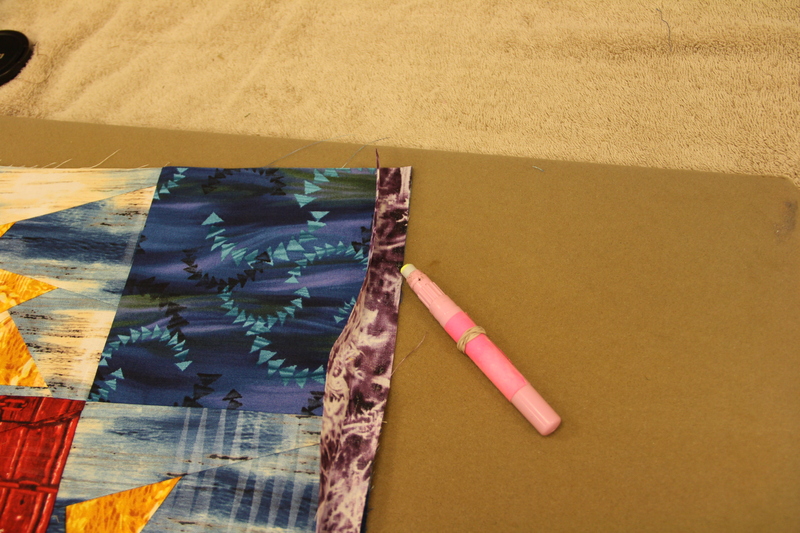 Slide the accent fabric (1 1/2″ x 10″) under the piece you just trimmed. 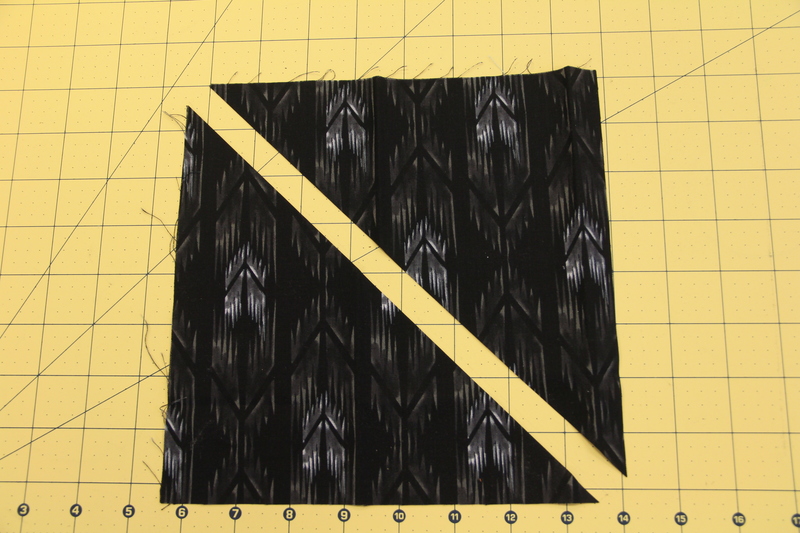 This fabric should be RIGHT side up! 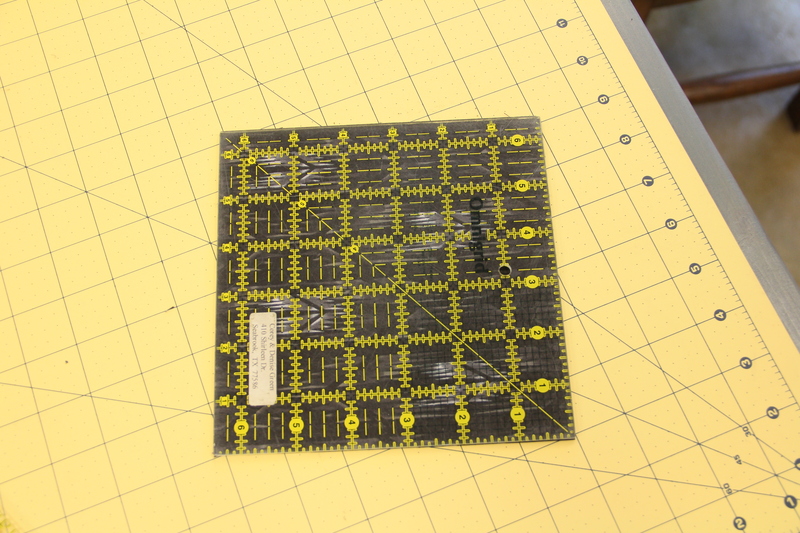 Then press – this is what it will look like. 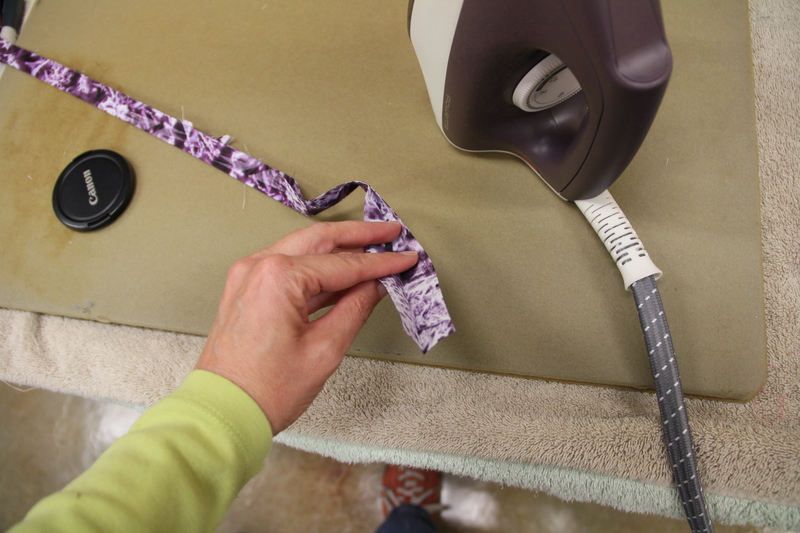 Use your add-a-quarter ruler and trim away the excess accent fabric. 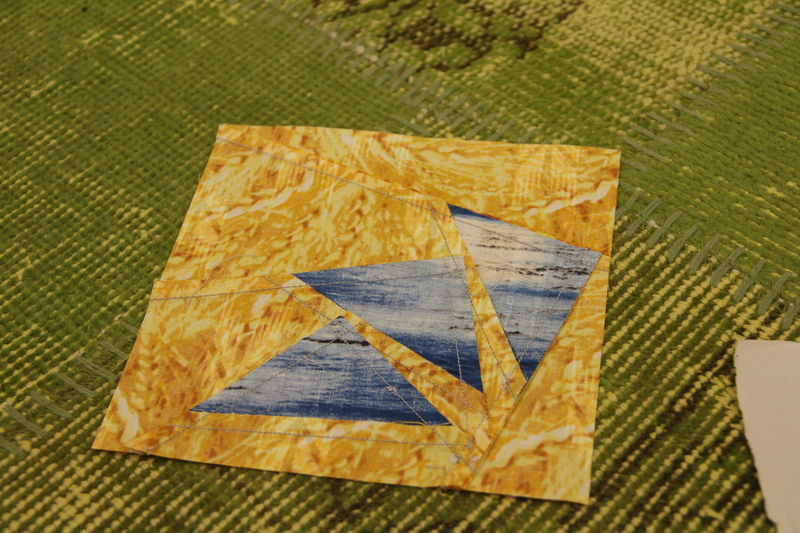 Slide the appropriate color triangle RIGHT side up under the piece you just trimmed (in my example this is the yellow with trees). 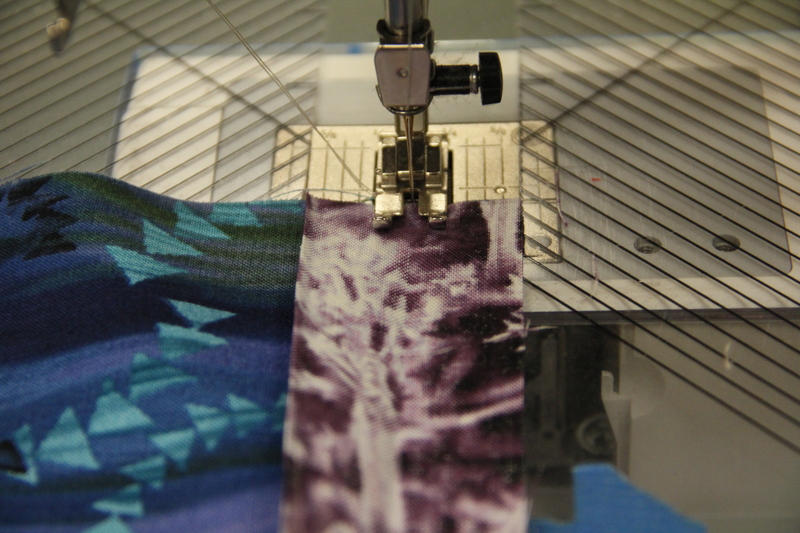 Stitch on SOLID line 2. 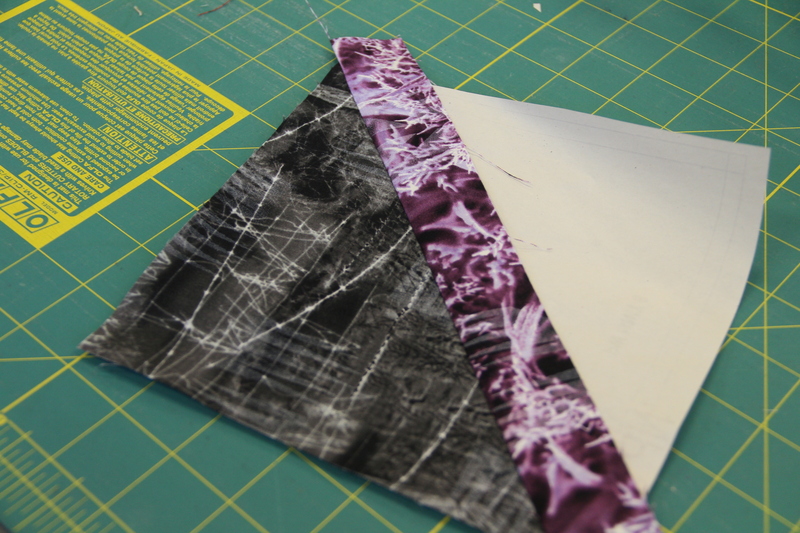 Press and now you are ready to trim. 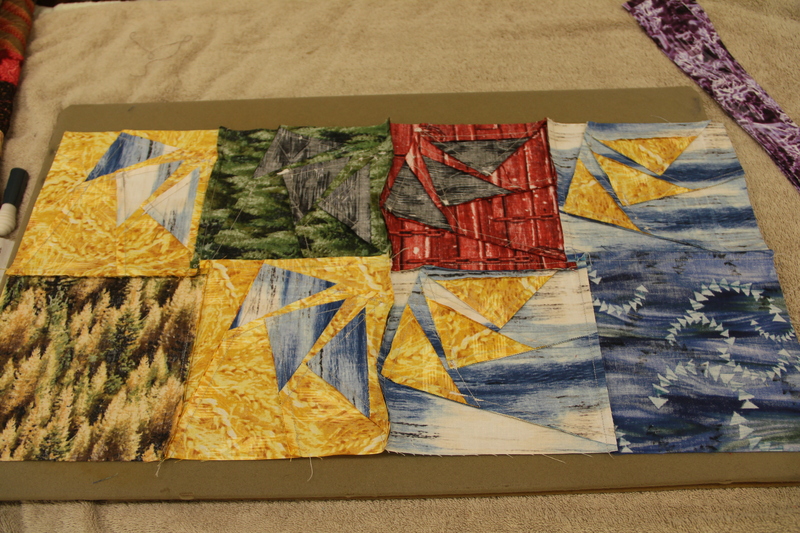 The finished block all trimmed up and ready! 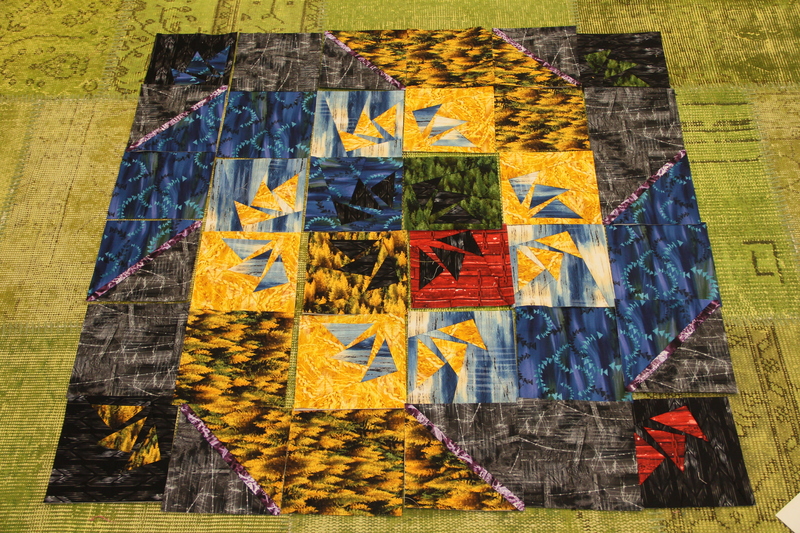 On the design wall (or floor) layout your quilt – adjust the blocks as necessary. At this point I like to take a photo with my phone; just in case I mix something up! 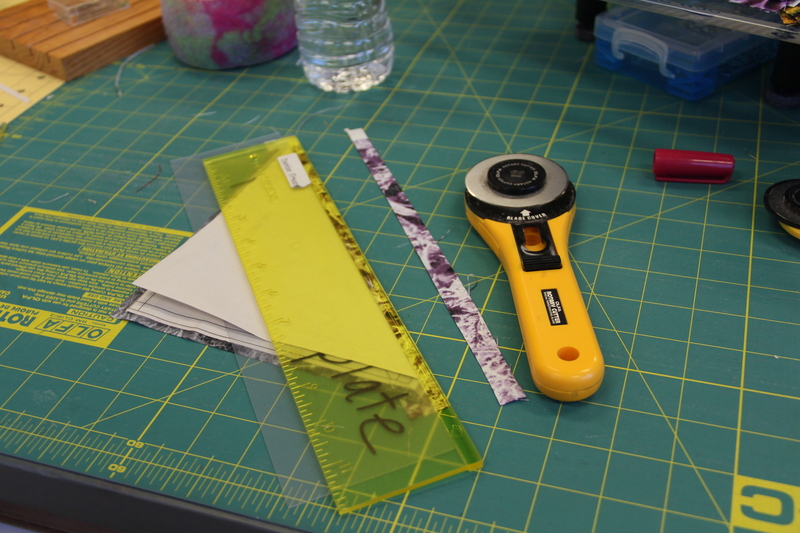 Now you are ready to start pulling paper off. Start with Section 10 and work your way back to section 1. 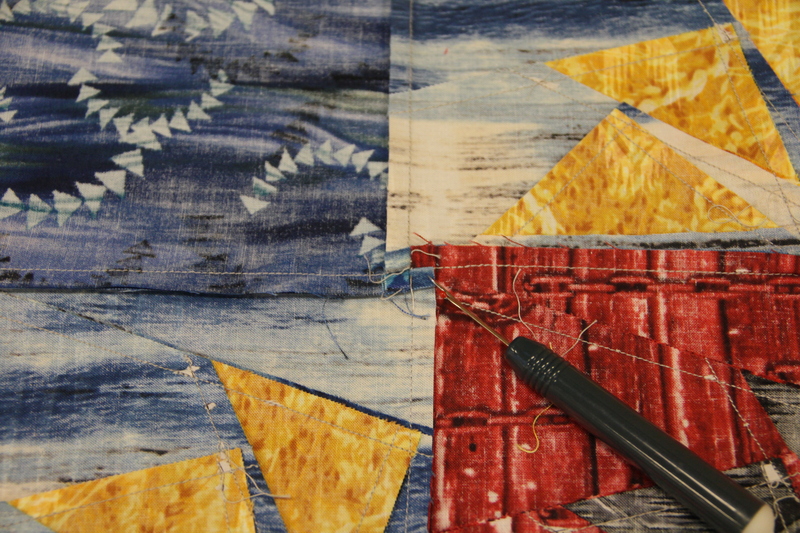 I like to use my fingernail to hold the stitches at the beginning so they do not pull apart as I remove the paper. 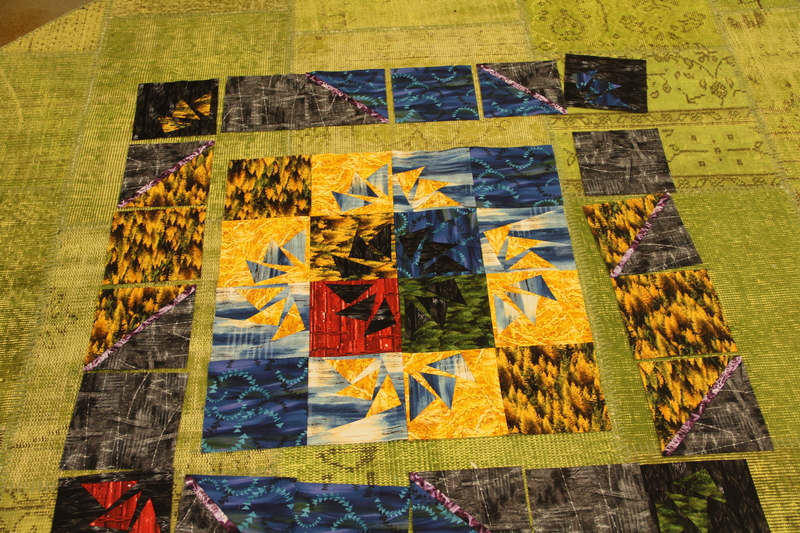 Carefully progress through the block. 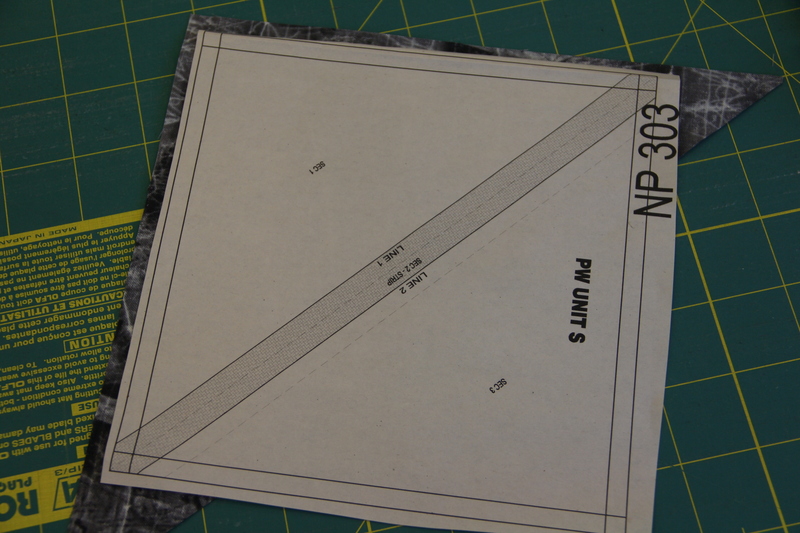 Once the paper is all removed; I place my block back on the design wall in it’s proper place. 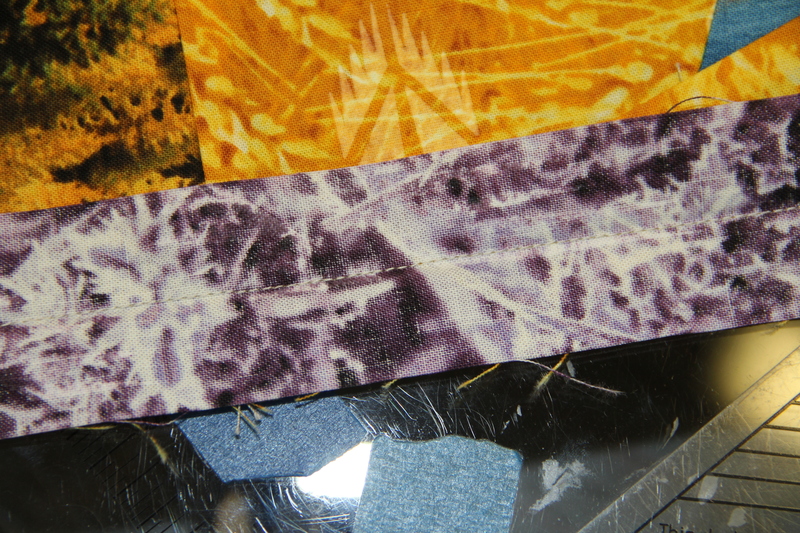 Sew the first 2 pairs together and press counter-clockwise from the back. 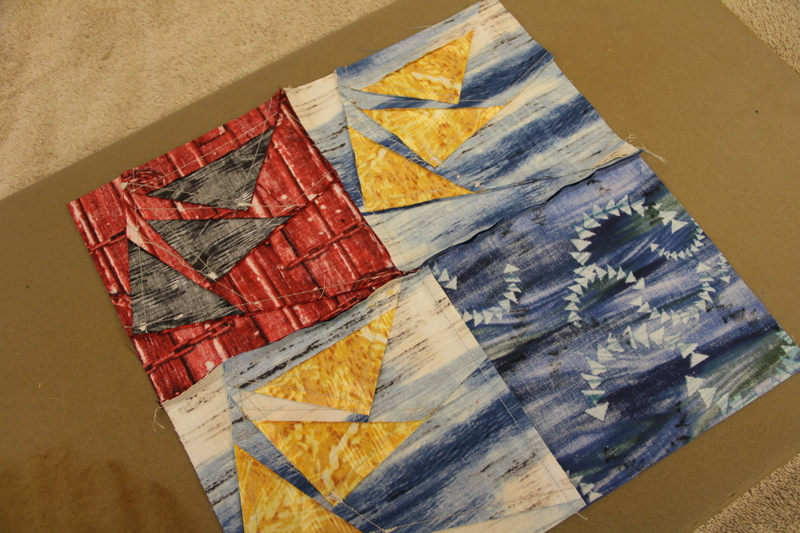 Now stitch the 2 pairs together to make a 4-patch. 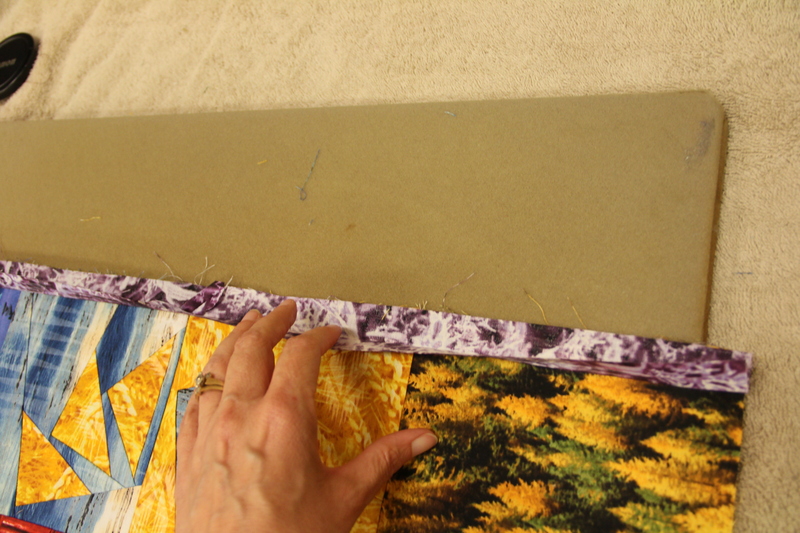 BEFORE pressing you need to “un-sew” a few stitches so we can spin the center so it lays very flat and will nestle with the next set of seams. 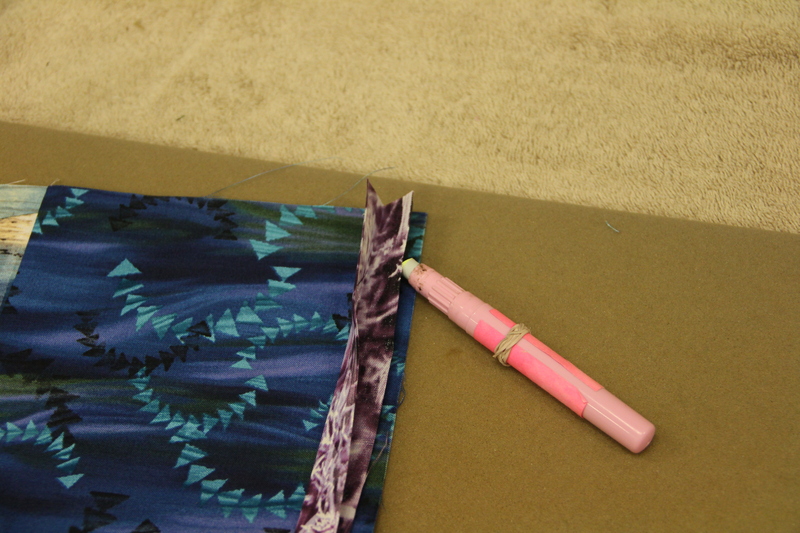 Carefully un-sew to the seam you just sewed and now you will be able to spin the center and ALL of the seams can be pressed counter-clockwise. 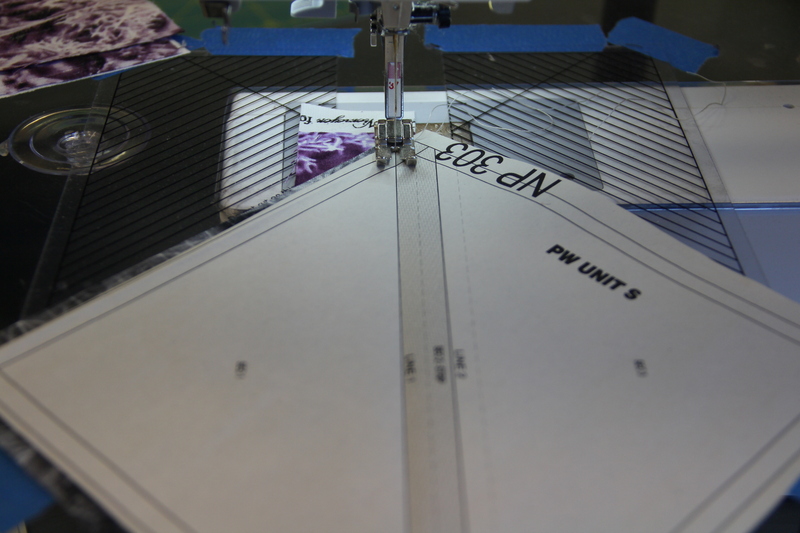 Un-Sew to the seam you just stitched and now you can spin – I like to leave the threads to prevent the threads from attempting to un-sew themselves anymore. 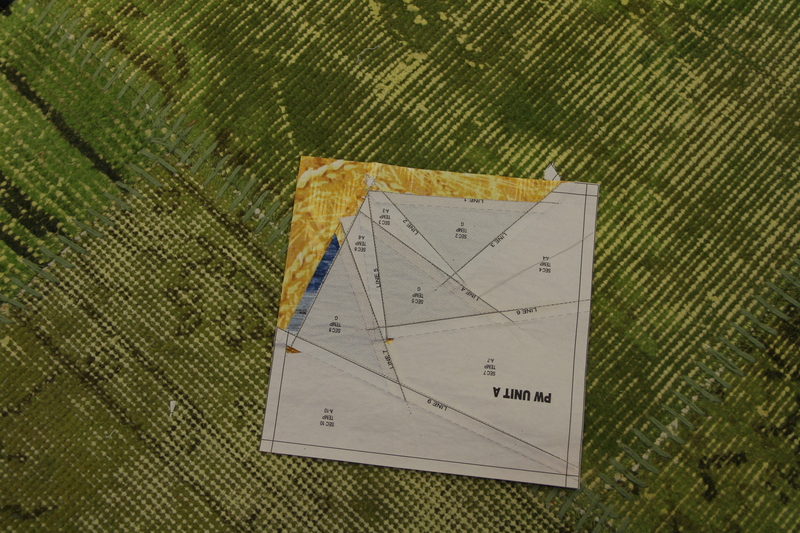 You will repeat the “un-sew and spin” step as you sew your quadrants together. 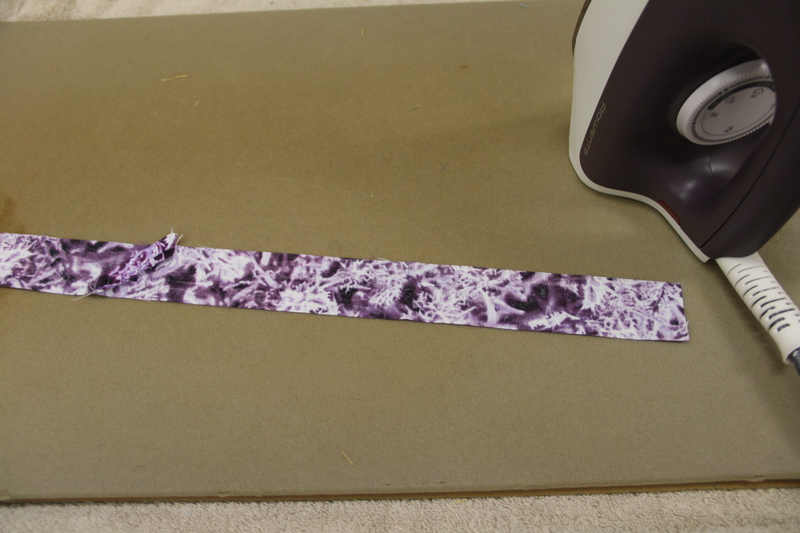 And with our final seam the center is done. 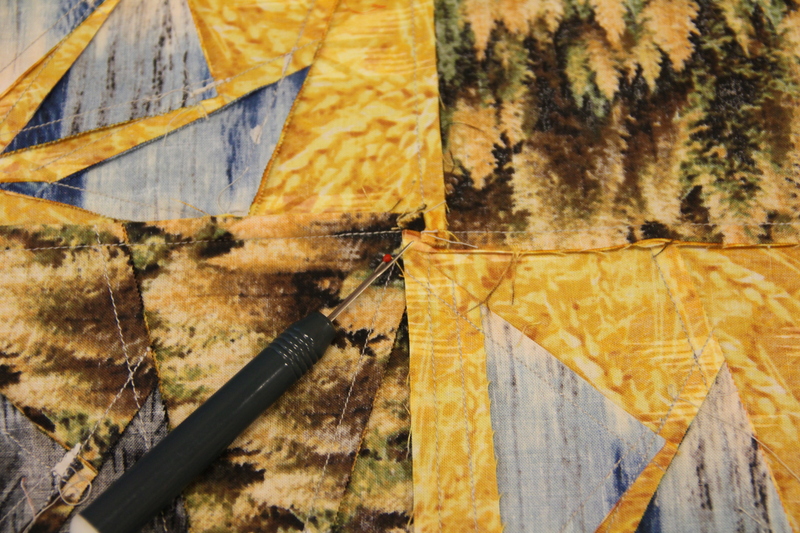 Don’t forget to “un-sew and spin” this final seam. NOW for my favorite part! 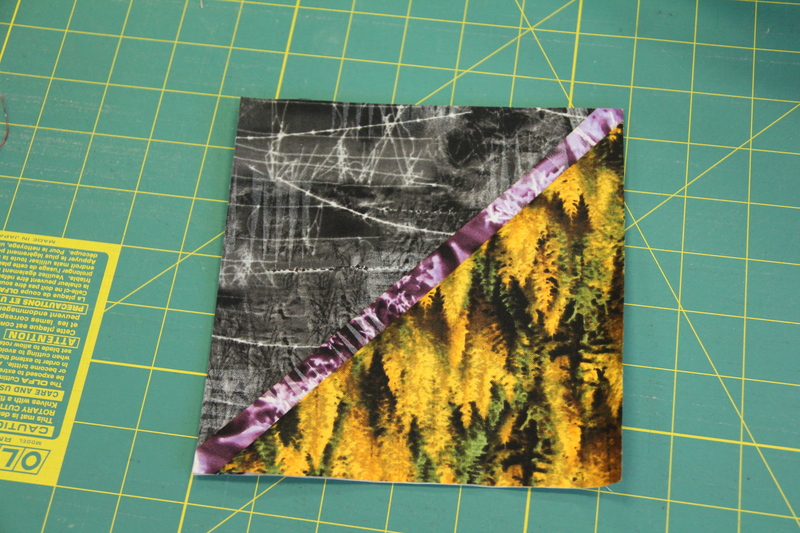 I use this technique anytime I want to add a “skinny” accent border. 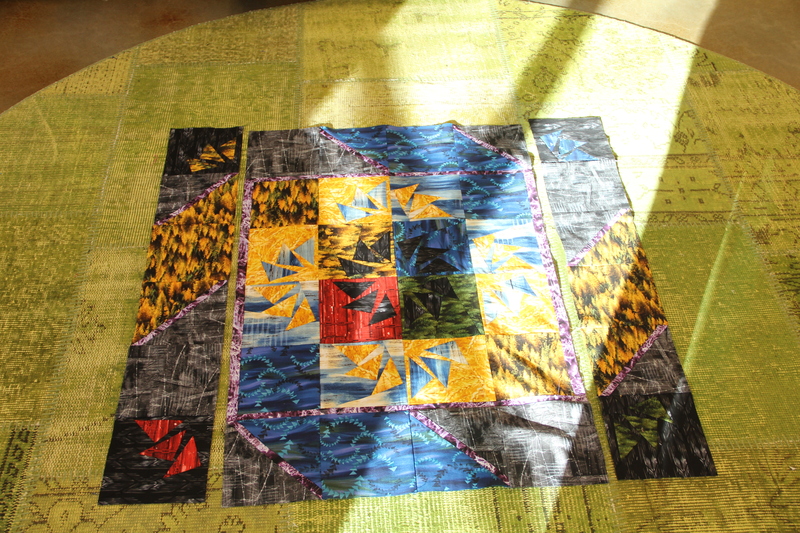 I don’t have to do any math as I am not changing the size of any existing pieces, I am just overlaying an accent piece. 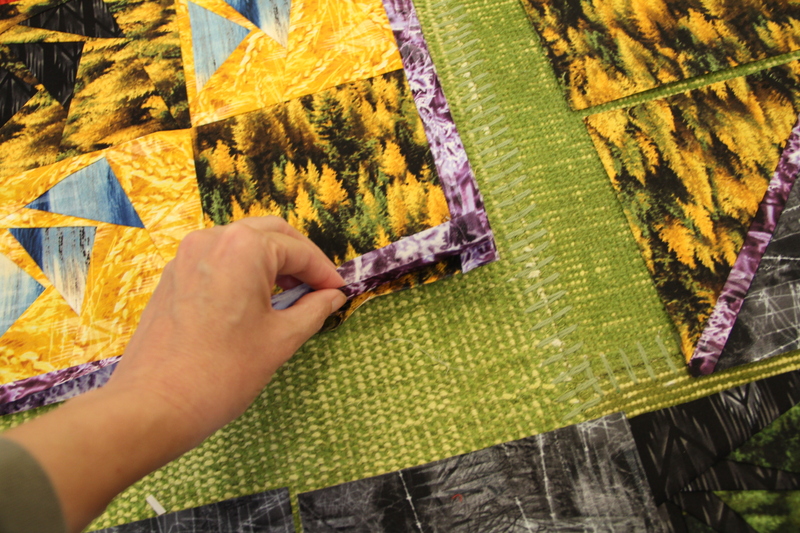 Find a project and TRY THIS – you will love it! 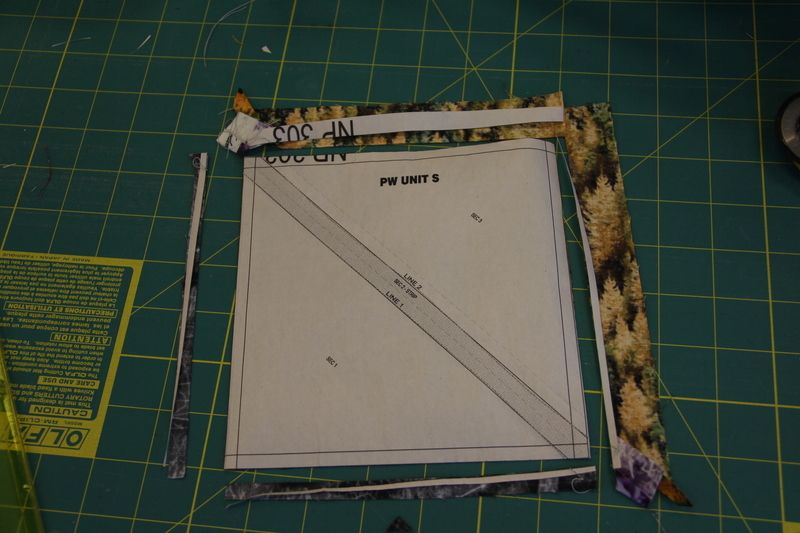 This photo shows the two glued together – do not glue the accent closed! 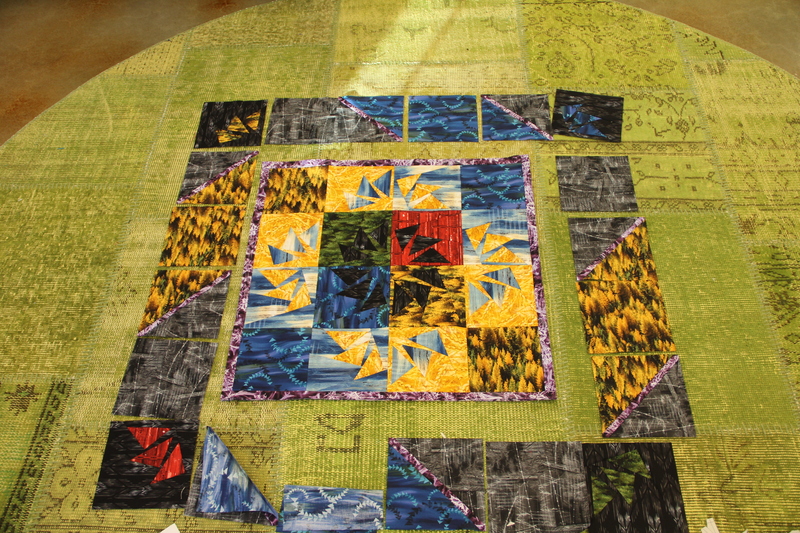 This photo shows the center with the accent pieces added. 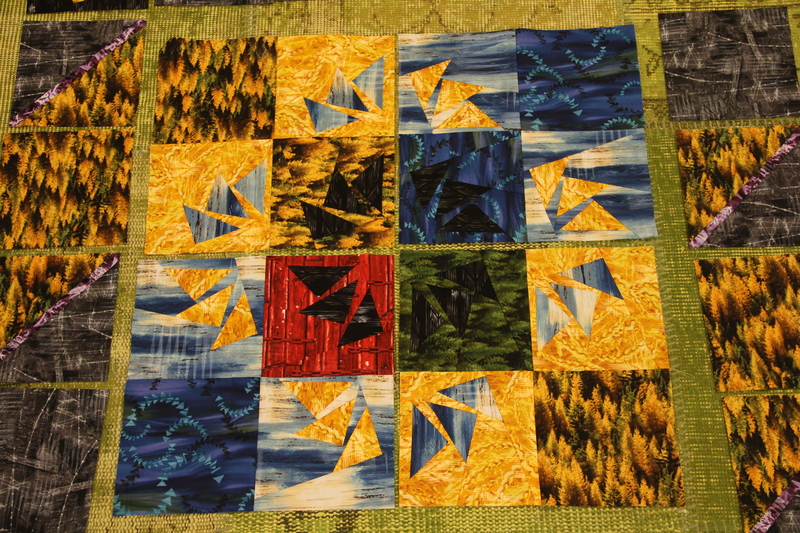 Now stitch the side blocks together and the top/bottom blocks together. 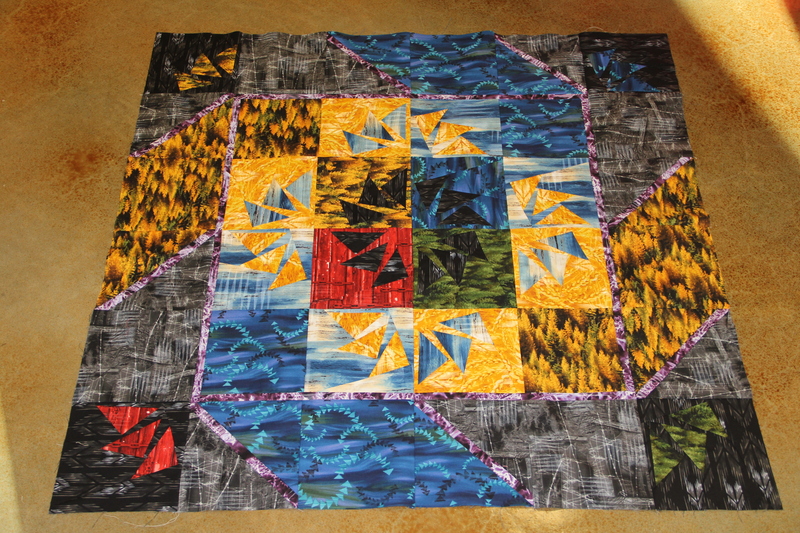 Add the last 2 borders and you have finished your quilt top. I hope you find this tutorial helpful! 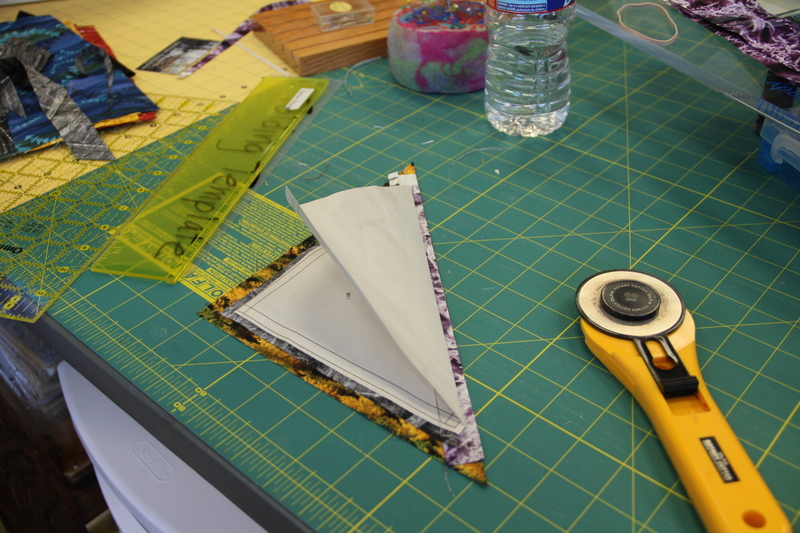 I hope you will no longer be intimidated by paper-piecing! 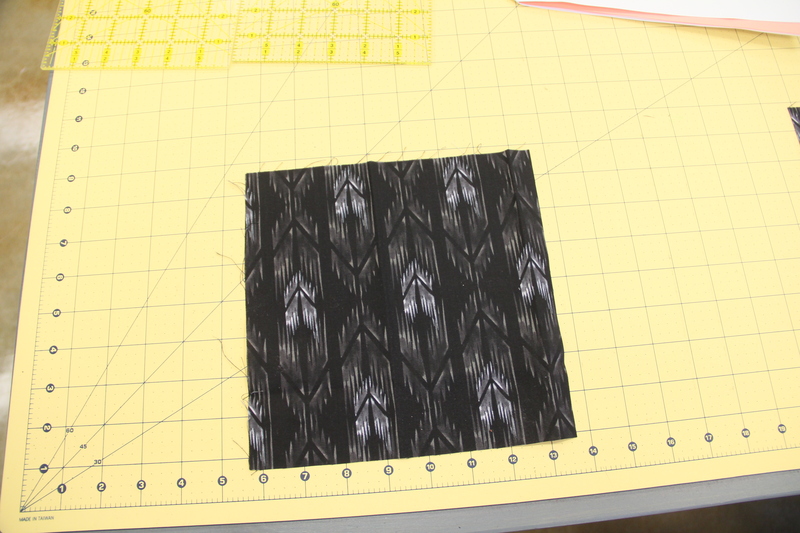 You can click here to shop for a pattern and get started on your project today! 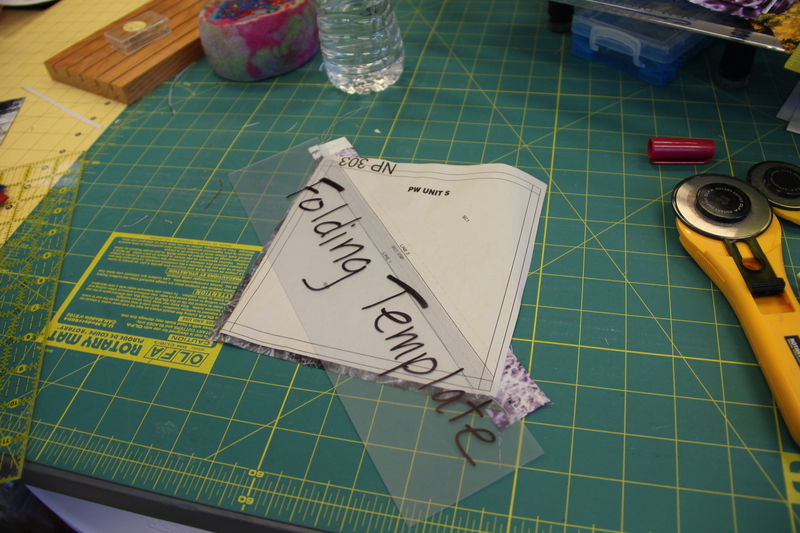 This entry was posted in Tutorials, Workshops and tagged Paddlewheel. Bookmark the permalink.